Bee-eater (Merops apiaster) breeds in southern Europe and in parts of northern Africa and western India. TAGS: Bird painting of Bee-eater, bird sketch of Bee-eater, bird drawing of Bee-eater, bird art of Bee-eater, bird illustration of Bee-eater. The Hoopoe (Upupa epops) is found in much of Europe, Asia and North Africa. Hoopoe is partially migratory while the southern populations are sedentary. The European population moves in August to October to wintering areas in Africa, and will return in April to May. Hoopoe nests in tree holes, among blocks of stone, often stone walls. Hoopoe feeds on large insects and small lizards, and likes to pick in droppings for food. The Hoopoe is Israel's national bird. TAGS: Bird painting of Hoopoe, bird sketch of Hoopoe, bird drawing of Hoopoe, bird art of Hoopoe, bird illustration of Hoopoe. TAGS: Bird painting of Kookaburra, bird sketch of Kookaburra, bird drawing of Kookaburra, bird art of Kookaburra, bird illustration of Kookaburra. The Brown-headed Paradise Kingfisher (Tanysiptera danae), also known as the Russet Paradise Kingfisher. It is endemic to Papua New Guinea. The Amazon Kingfisher (Chloroceryle amazona) is a resident breeding bird in the lowlands of the American tropics from southern Mexico south through Central America to northern Argentina, with at least one bird having strayed north to Texas. 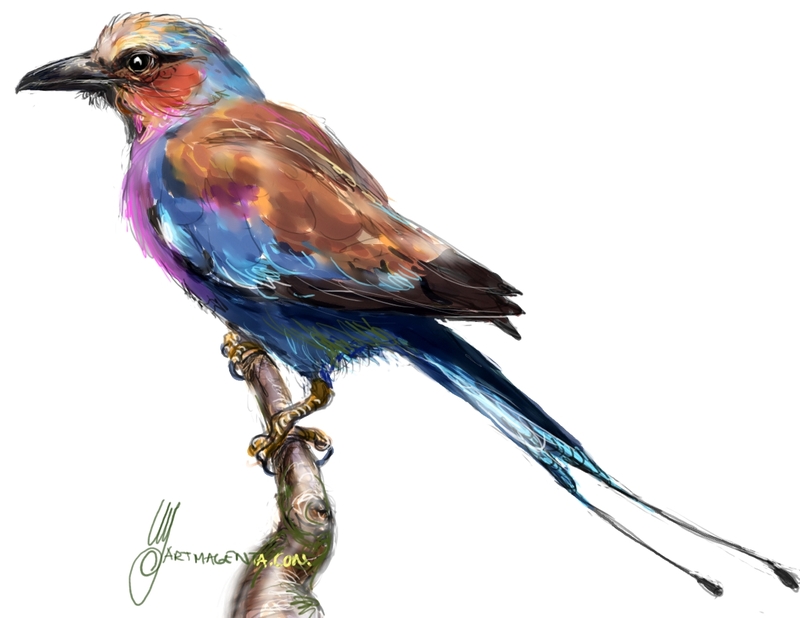 TAGS: Bird painting of Amazon Kingfisher, bird sketch of Amazon Kingfisher, bird drawing of Amazon Kingfisher, bird art of Amazon Kingfisher, bird illustration of Amazon Kingfisher. The Kingfisher (Alcedo atthis) has a palearctic breeding distribution. In large parts of its range, it is a resident bird, but Kingfishers move in the winter from the areas where the rivers freeze. The grey-headed kingfisher (Halcyon leucocephala) has a wide distribution from the Cape Verde Islands off the north-west coast of Africa to Mauritania, Senegal and Gambia, east to Ethiopia, Somalia and southern Arabia and south to South Africa. European Roller (Coracias garrulus) is a migratory bird that breeds in northern Africa, southern and southeastern Europe, Middle East and east to southwestern Siberia and central Asia. Its northernmost occurrence is in the Gulf of Finland and of Lake Ladoga in Russia. The Roller winters over large parts of sub-Saharan Africa but a majority in East Africa. The lilac-breasted roller (Coracias caudatus) is widely distributed in sub-Saharan Africa and the southern Arabian Peninsula. The Banded Kingfisher (Lacedo pulchella) is a tree kingfisher found in the lowland tropical forests of Myanmar, Thailand, Cambodia, Vietnam, Laos. Malaysia, Sumatra, Java and Brunei. It is extinct in Singapore.